Tandem riders divide up wheel-weight and aerodynamic resistance between them, making it easy to reach high speeds without breaking a sweat. And the breath they save can be used for relaxed conversation along the way. So all in all, riding tandem does nice things for your quality of life. 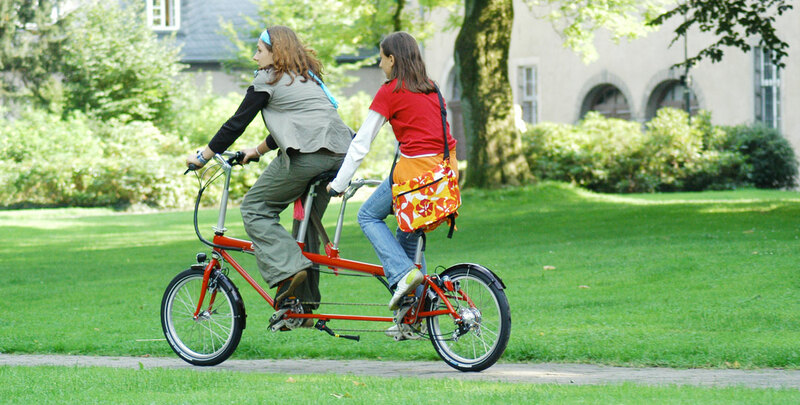 We’ve transferred the basic concept of our folding bikes to our folding tandem. We’ve combined the stable, low-resistance 20-inch wheels and the shock-absorbing swingarm with an especially stable frame. And we’ve adapted its compact geometry to the special needs of tandem riders. This all makes riding our folding tandem exceptionally easy and safe. Even at high speeds, you always feel like you’ve got everything under control. The wheelbase, shorter than in 26″ and 28″ tandems, makes taking tight curves a snap—a good thing in more than just city riding. This manoeuvrability also makes it very easy to keep your balance. So mastering our tandem doesn’t take long at all. On trains or on local public transportation systems, they’ll fit into nearly all bike racks and compartments even in ready-to-ride form. So getting on and off public transportation is stress-free. 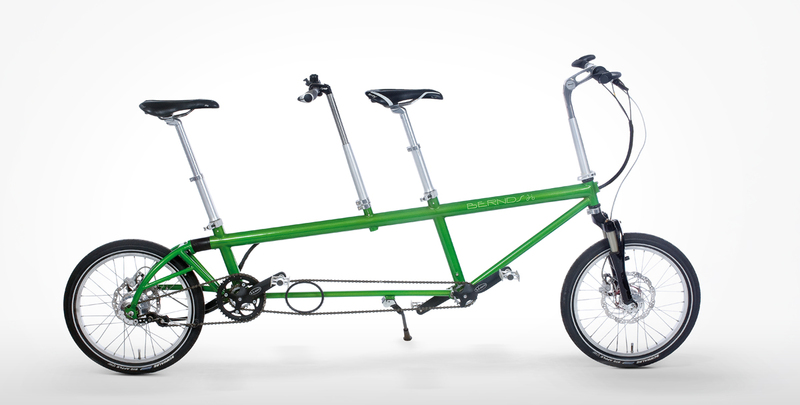 For transport by car, our tandem can be folded up in five-to-ten minutes. And it fits inside standard mid-sized cars with no problem. So you don’t need a tough-to-mount roof rack or rear rack. And by the way: transporting bikes on a rack costs you around 1 litre of fuel per 100 km. Our tandems are suitable for individuals between 1.40 and 2.10 m tall, making them ideal for families. The rear handlebars and the saddle for the front rider can be adjusted independently of one another. And our folding tandems, just like our other bikes, can use standard-sized handlebars, stems and seat posts. Additionally, numerous luggage accessories are available by request. We prefer to use wide and stable tires that grip the ground exceptionally well. This makes for a sufficient reserve of friction when braking and combines efficient shock absorption with low rolling resistance. And we equip all of our folding tandems with exceptionally high-quality brakes. The recommended hydraulic disc brakes make for particularly short braking distances even in wet conditions. Our tandem model can take a maximum total load of 260 kg. Even if you might not need that right now, it’s always nice to have this reserve in the back of your mind—after all, who knows who you might end up taking along on a tour? The Bernds Tandem is available in total weights starting at 18kg.